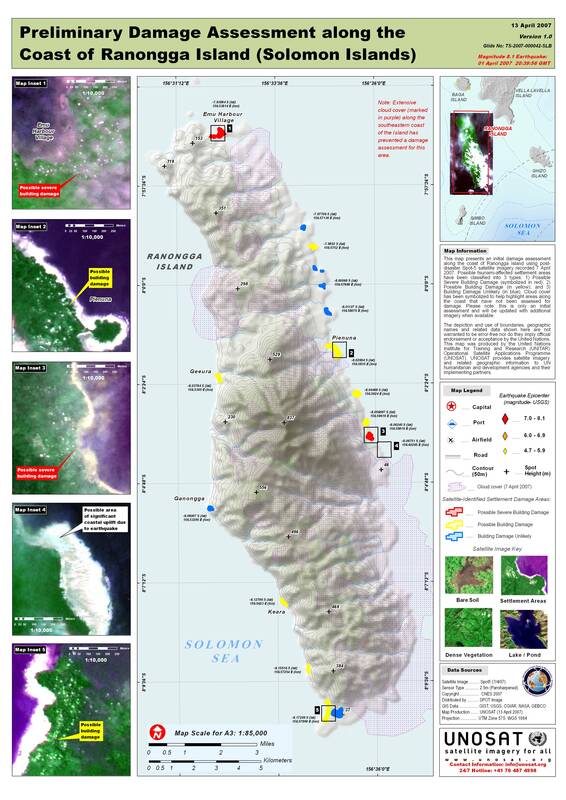 This map presents an initial damage assessment along the coast of Ranongga Island using post-disaster Spot-5 satellite imagery recorded 7 April 2007. Possible tsunami-affected settlement areas have been classified into 3 types: 1) Possible Severe Building Damage (symbolized in red); 2) Possible Building Damage (in yellow); and 3) Building Damage Unlikely (in blue). Cloud cover has been symbolized to help highlight areas along the coast that have not been assessed for damage. Please note: this is only an initial assessment and will be updated with additional imagery when available.